KATHMANDU, March 6: Cement industries have been found flouting standards prescribed by the government. 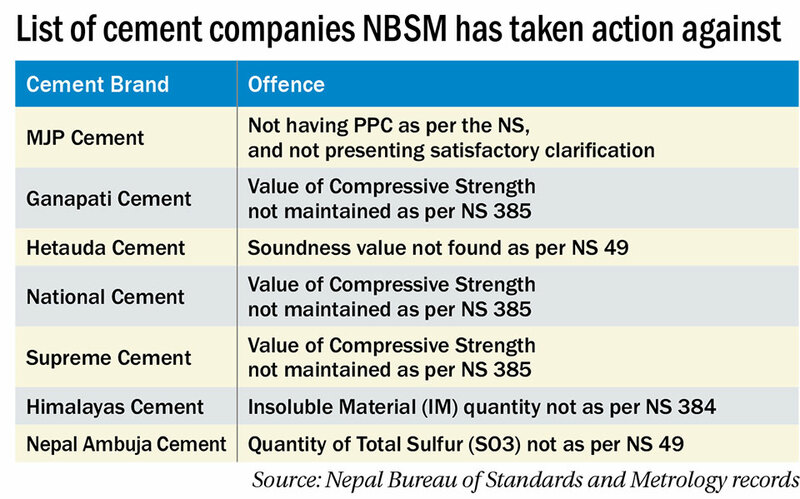 Nepal Bureau of Standards and Metrology (NBSM) has so far taken action against seven industries that were found flouting standards in the current fiscal year. The bureau found defects in product declarations made by the industries, an official of NBSM told Republica. According to the bureau, quality of product is different from declarations made by most of the industries. Cement factories facing the NBSM wrath include MJP Cement, Ganapati Cement, Hetauda Cement, National Cement, Supreme Cement, Himalayas Cement, and Nepal Ambuja Cement. The bureau has suspended license of MJP Cement, and sought clarification from other six industries. It has directed the industries not to send products of that batch to the market until the issue is resolved. These companies were not found not maintaining product quality and volume of components. Likewise, they failed to meet technical requirements like Compressive Strength Grade prescribed by the Nepal Standard (NS) Regulations and agreed by the manufacturers. Compressive strength of a cement product is measured on the basis of ability of the cement-made structure to withstand compression (the pressure that tends to reduce the size). Mishra further added that some industries are not following manufacturing requirements, which also includes chemical requirements, mentioned in the NS Regulations. “Most of the companies were found not maintaining the compressive strength as declared by them,” he added. NBSM has asked all the industries to furnish written clarification within 15 days of the inspection. The bureau rescinds the actions taken against the manufacturers if the latter make the improvements. However, it takes action against the guilty companies if they fail to make needful improvement. KATHMANDU, Dec 25: Construction experts have stress on the usage of the quality materials including cement for better construction works.